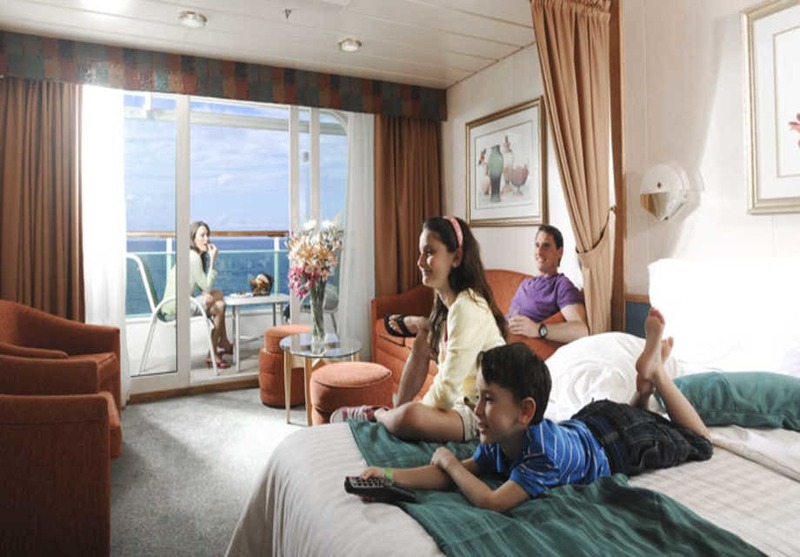 Welcome to Royal Caribbean’s Grandeur of the Seas with plenty to keep every type of guest happy. 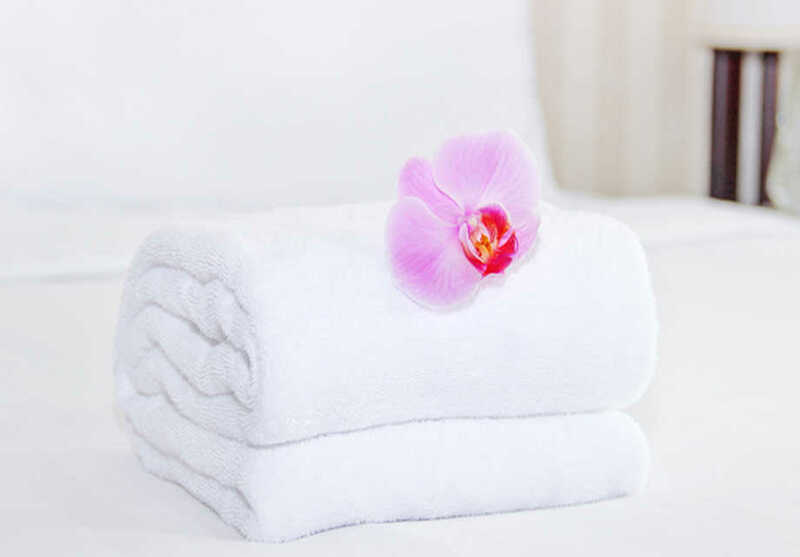 For those in search of blissful relaxation, there’s Vitality Spa where staff wait to massage you into happiness. A roll of the dice in Casino Royale may bring you another reason to smile. Scale the heights above the waves on the top deck rock climbing wall and scope out the heavens at the stargazing Observatory. Fill up on a Far Eastern feast at Izumi and work it off at Vitality Gym, if you like. Hey adults, the Solarium’s just for you but don’t worry the kids will be loving their activity-rich clubs and the teens will have all the space they need in their amazing area. 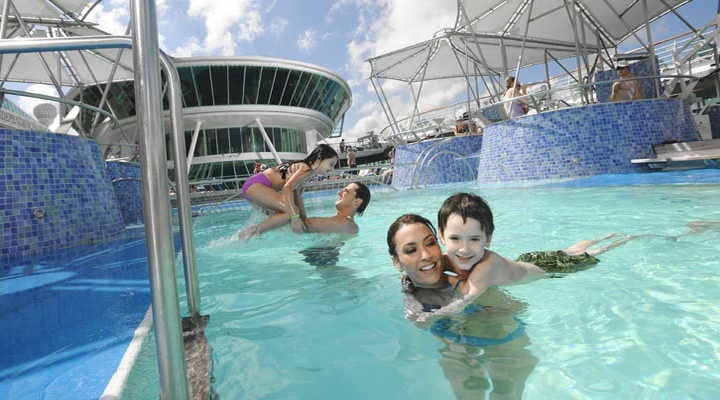 Yes, this is activities, relaxation and fun on a grand scale and with Royal Caribbean, you wouldn’t expect anything less. Meal-times, snack times or just an ice-cream treat - on Grandeur of the Seas assortment is the key. 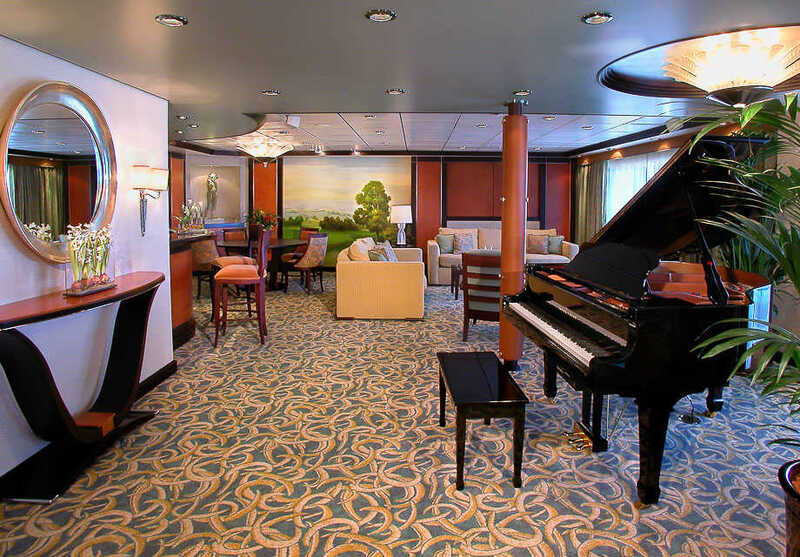 Royal Caribbeans ships have a fantastic variety from designer stores to quirky art auctions, duty-free essentials to fashion. Fill your days with excitement or tranquillity. Take your pick – this is your holiday. 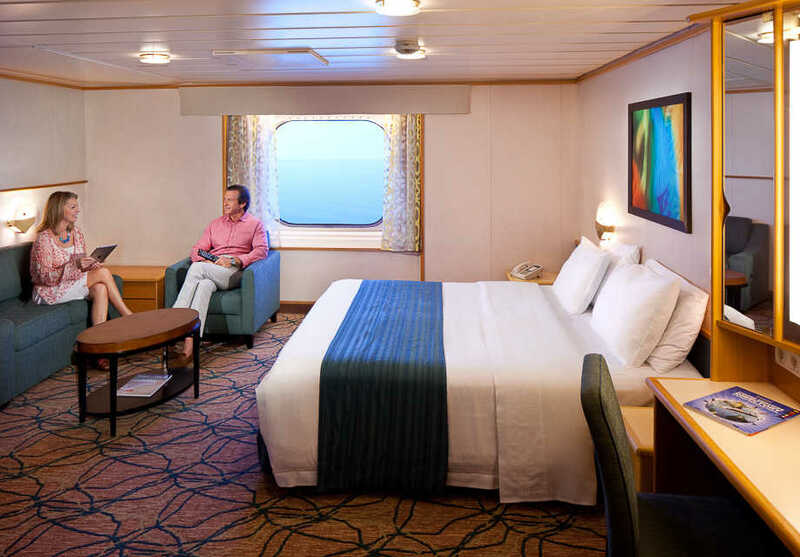 With a sports court, table tennis and a rock-climbing wall to start you off there's always plenty for families aboard Grandeur of the Seas. Full productions in the Palladium Theatre bring Broadway to the ocean whilst Centrum makes the night come alive. Modern and relaxing coffee bar where you can complement your Cappuccino with a light snack as you watch the go by. 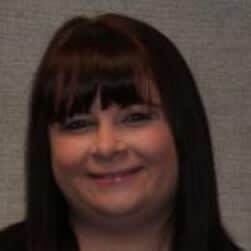 Looking for some you-time? Take your book or borrow one from the shelves then sink into a comfy chair and enjoy some peace. Enjoy world famous Ben & Jerry's ice cream at sea. Entertainment, dancing and live music. This store showcases the various professional photographs captured during the ships voyage and available for purchase. You may also buy cameras and accessories here. You'll find everything from cruise wear and liquor to perfume and jewelry at these distinctive shops. Walk, run or jog your way around the track and take in some air whilst your on-board. Special stargazing area for exploring the heavens. For a small fee you can access the internet to catch up with friends, family and emails. This full size sports court is home to basketball, volleyball, dodge-ball, football and more - there's always a way to get active here. This state-of-the-art fitness facility contains all the space and equipment you need to keep fit whilst on board. which includes classes in yoga and tai chi. The ultimate in personal indulgence is waiting for you at the spa with its range of over 100 massage and pampering treatments including acupuncture. The Vitality Program offers advice on stress-management, nutrition, fitness and general health. 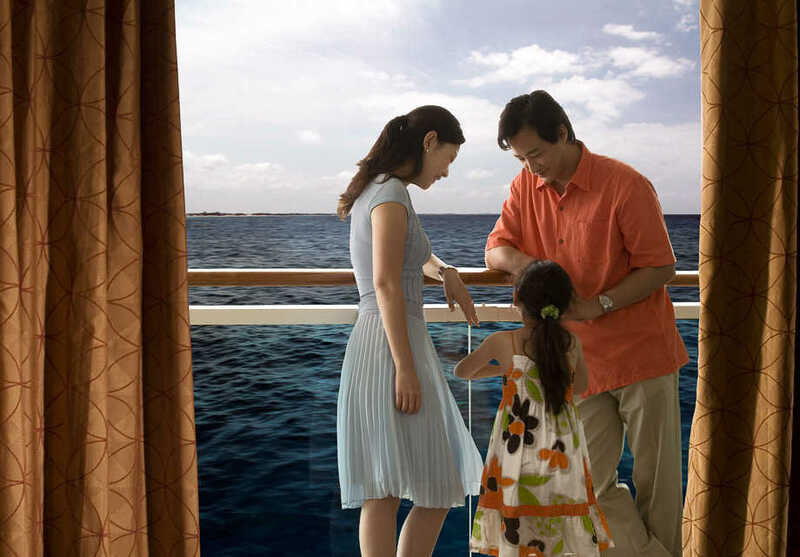 During your voyage take your family along to the family-friendly activities offered on-board including games, contests, enrichment classes and lectures. Teens will enjoy activities ranging from scavenger hunts and pizza parties to action in the video arcade. Enjoy a vanity area, private bathroom and great views of the ocean from the sofa of your sitting area. Enjoy a private balcony outside and a living area with a full-size sofa bed inside. Your bathroom has a tub and there's a queen size bed in the bedroom. 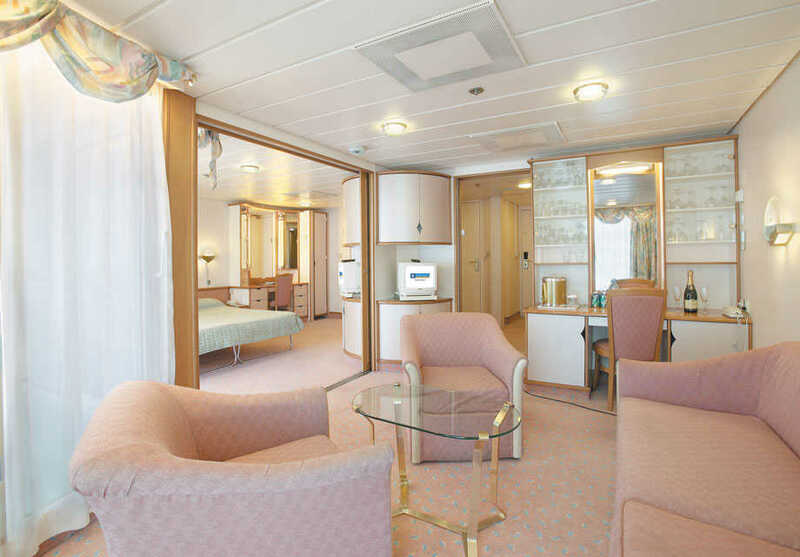 Enjoy a Royal king-size or twin beds and a bathroom with a vanity area. 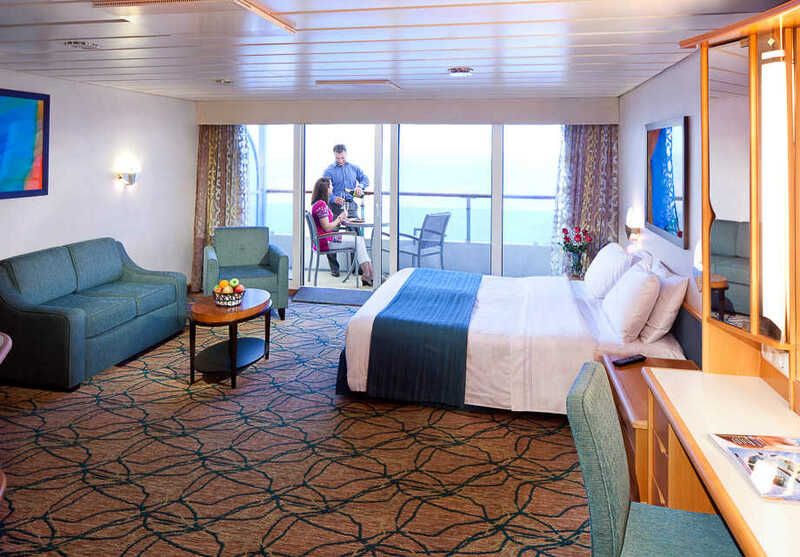 This spacious and luxurious suite includes twins or a king-size bed, a bathroom with a whirlpool bathtub and a private balcony. Guests in this suite will also enjoy a living room with a queen-size sofa bed, a dining table, fridge, entertainment centre and a baby grand piano. 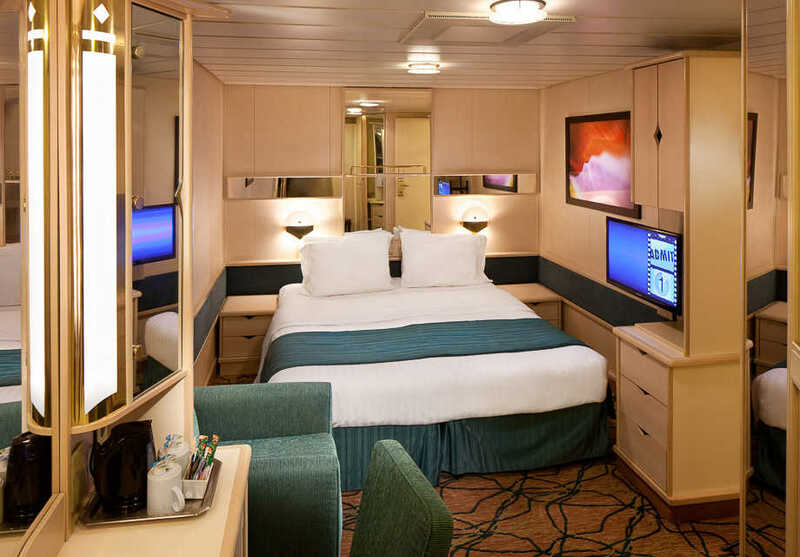 This stateroom has a choice of twins or a Royal king-size bed plus a private bathroom and sitting area with sofa. This spacious two-bedroom, two bathrooms, the accommodation provides ample space for a family or friends with separate sleeping areas alongside communal living space.